You must be a member of the Buenos Aires Brunch & Dinner Group to attend this activity. Would you like to join this group? 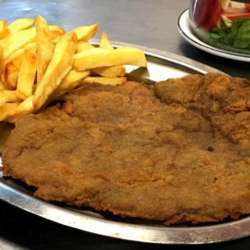 So, if you have been a while in Buenos Aires, you know that we think the Milanesa is our invention. And we pride ourselves. Mc Donalds even had to invent a sandwich with milanesa. Clarin recently posted an article with the top 10 places voted as the best milanesa joints. So this place is on it in the 8th place. Other than that, El Imparcial also has spanish cuisine and has existed since Protected content . I am not setting a limit but beware that closer to the date I will ask all of those that have signed up to reconfirm. Only those that answer will be counted.